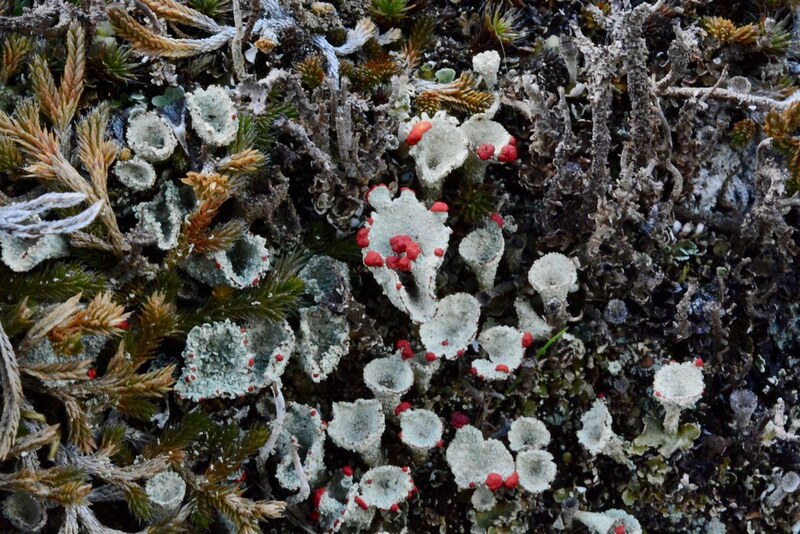 Today while loitering among the rocks on a nearly vertical cliffy area with a southern exposure (the only place around not still covered with snow), I could see a variety of tiny lichen colonies and was struck by the variety and sometimes the intensity of their individual colors. 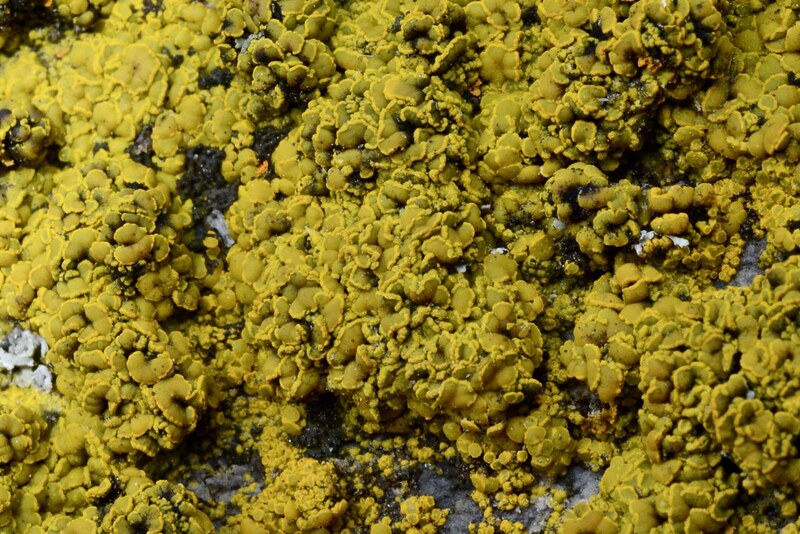 I wish I understood the purpose of those colors if indeed there is one. 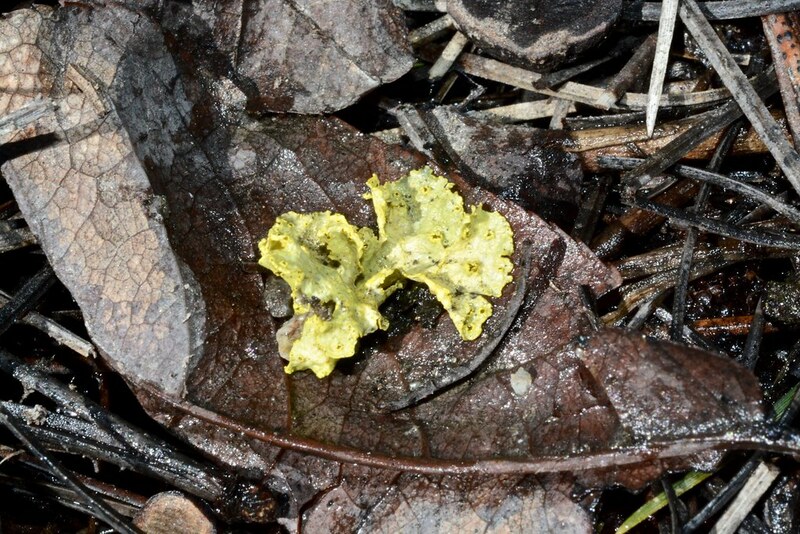 Mixed in among the buttercups yesterday there were a few (just a few) Pixie-cup lichens in their fruiting stage. 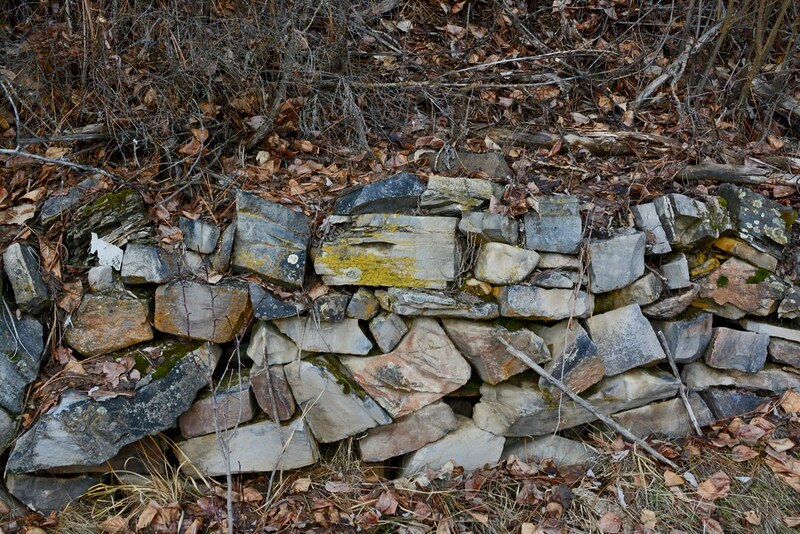 Along an old road on which I walk very often there are remnants of a rock wall, probably built by men in the Civilian Conservation Corps in the early 1930’s when the road was a US highway through northwest Montana leading to Idaho and on to Washington state (US 10A). 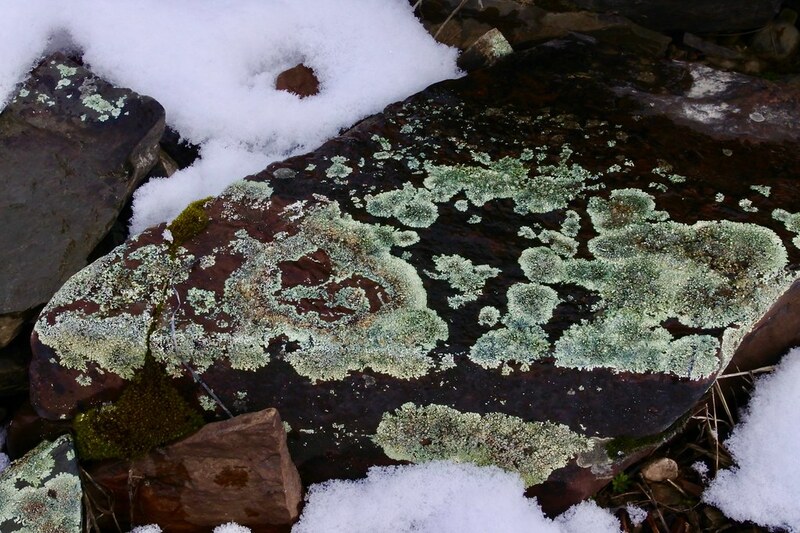 Over the years the rocks in the wall have become the homes of many species of lichens and add bright splashes of color, very welcome in winter. 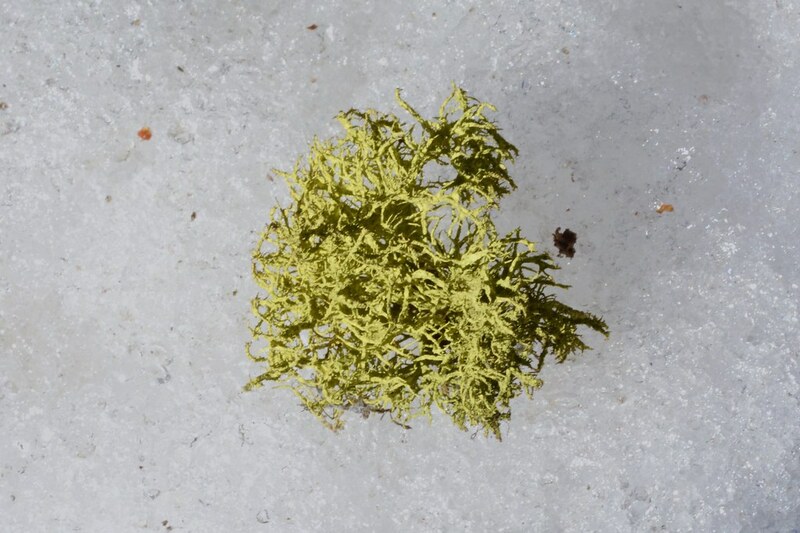 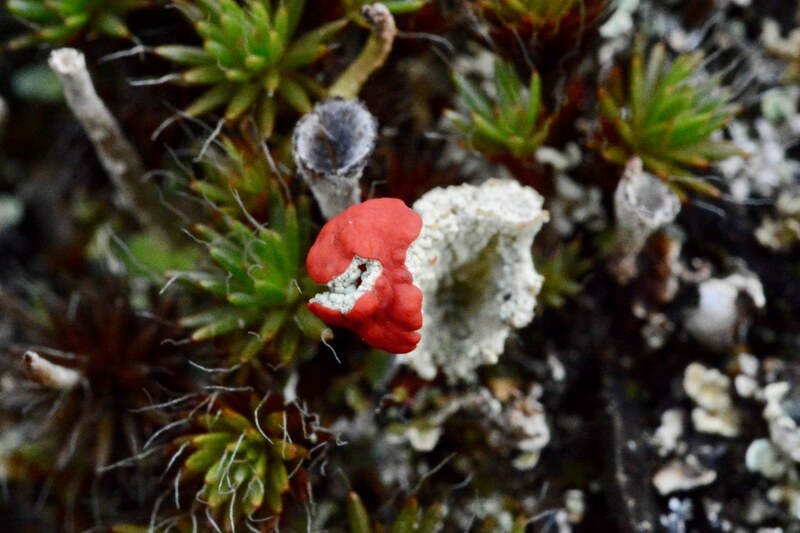 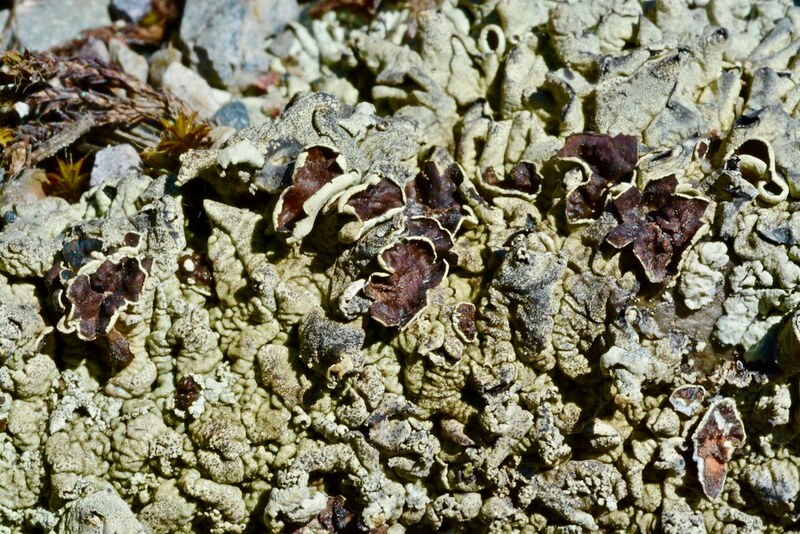 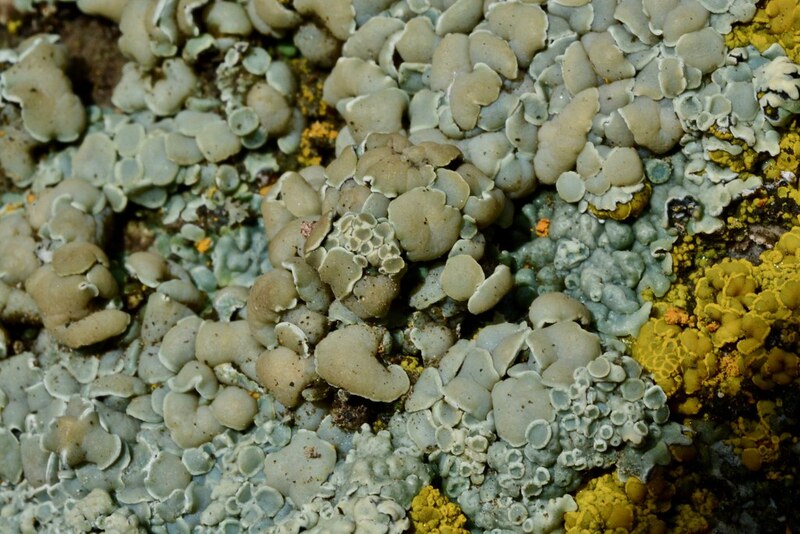 One of the aspects of lichens that makes them largely ignored is that many are so small that their details can hardly be seen by the unaided eye even though a large number of them growing together may provide a pleasant color in their surroundings. 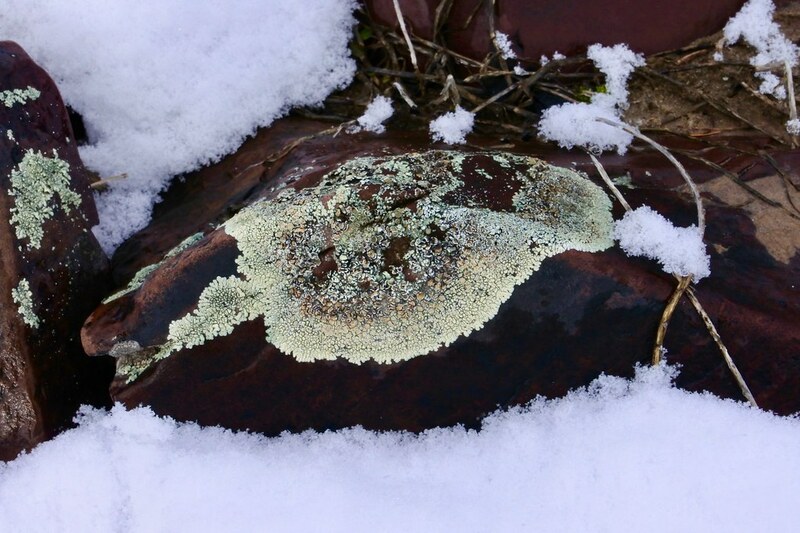 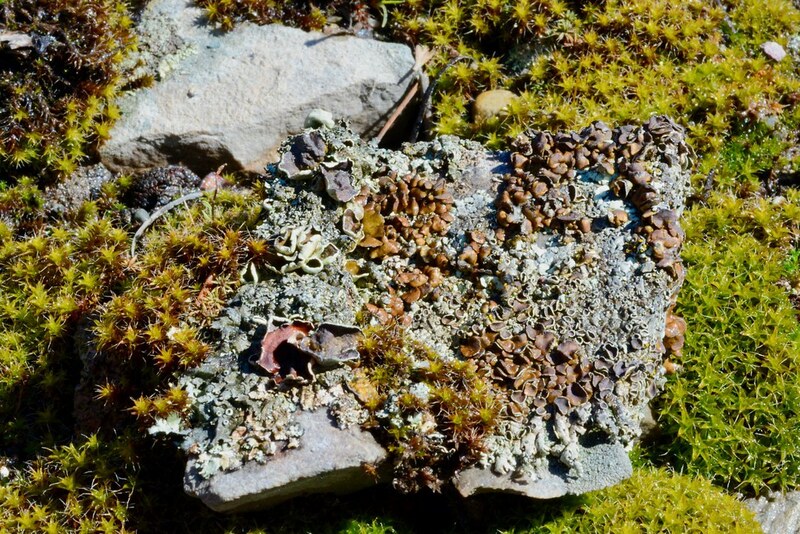 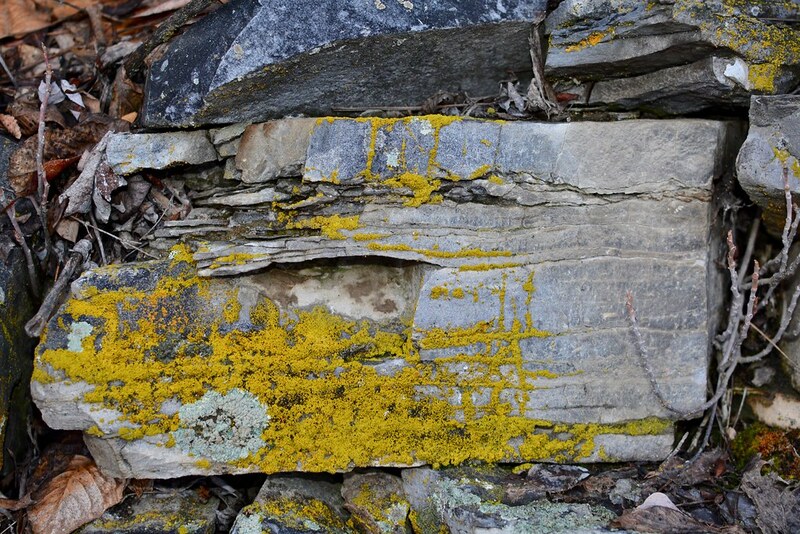 I was considering that today when I passed this section of the wall which contained a rock which is about a half foot tall and a foot wide, a large section of which is colored gold by a lichen colony. 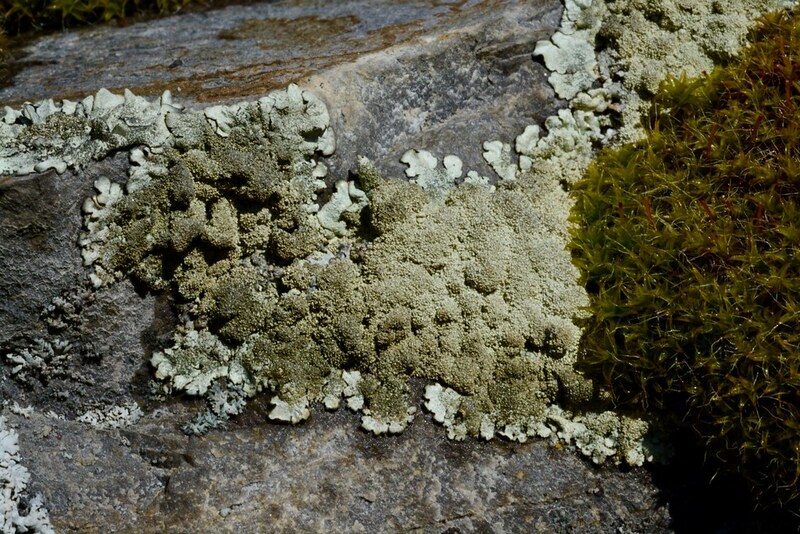 Here is a closer look at that rock and you can more easily see a small circle of another species of lichen in the lower left. 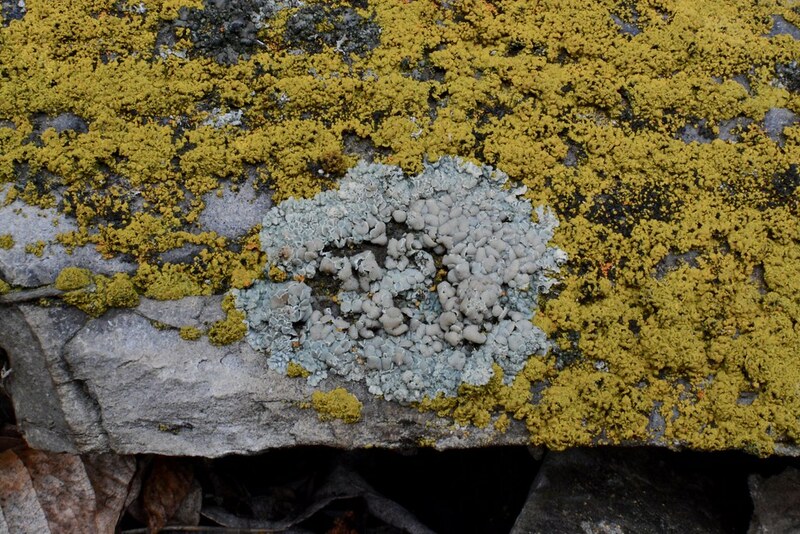 An even closer look in which you can begin to see the individual lichens in the circle. 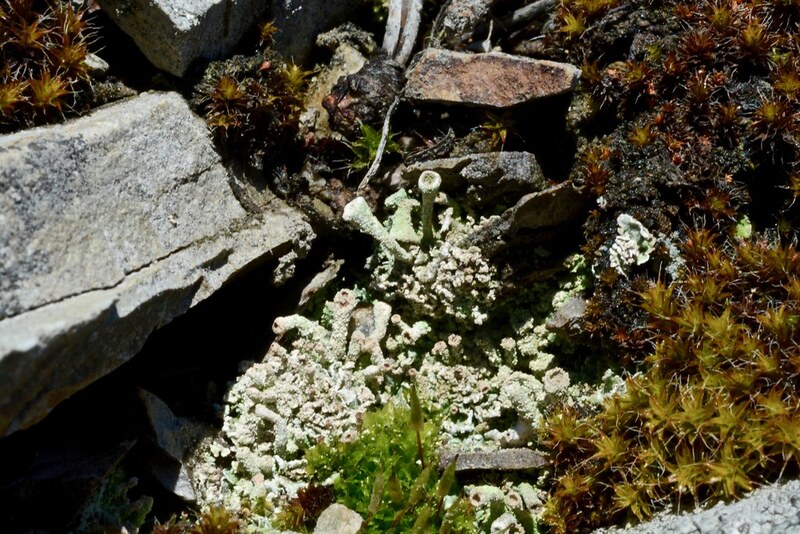 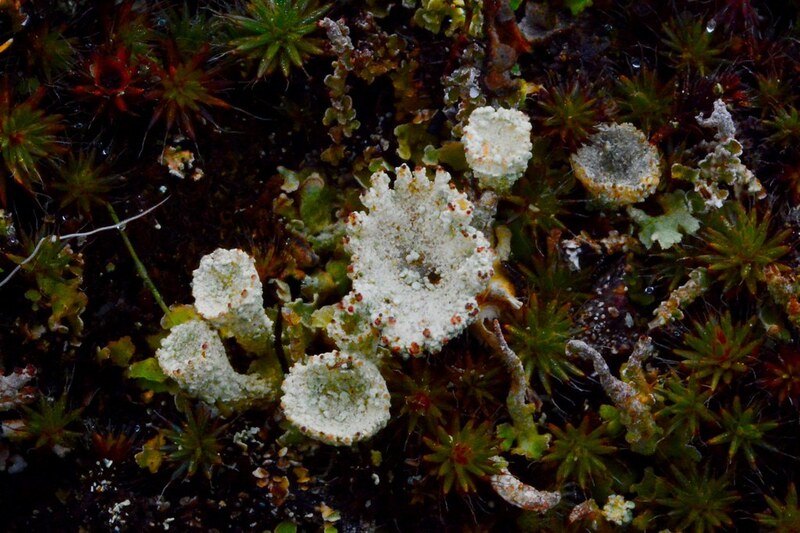 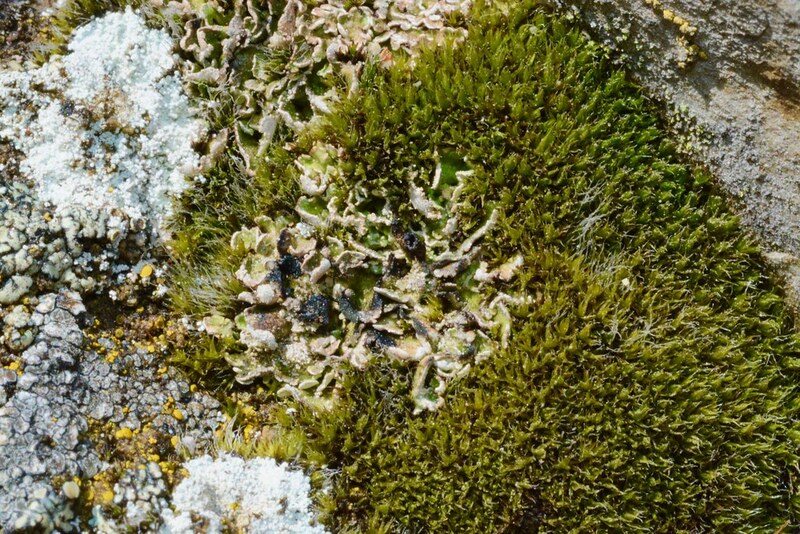 And a close-up of the colony in the circle (which I believe to be Rhizoplaca melanophthalma lichens). 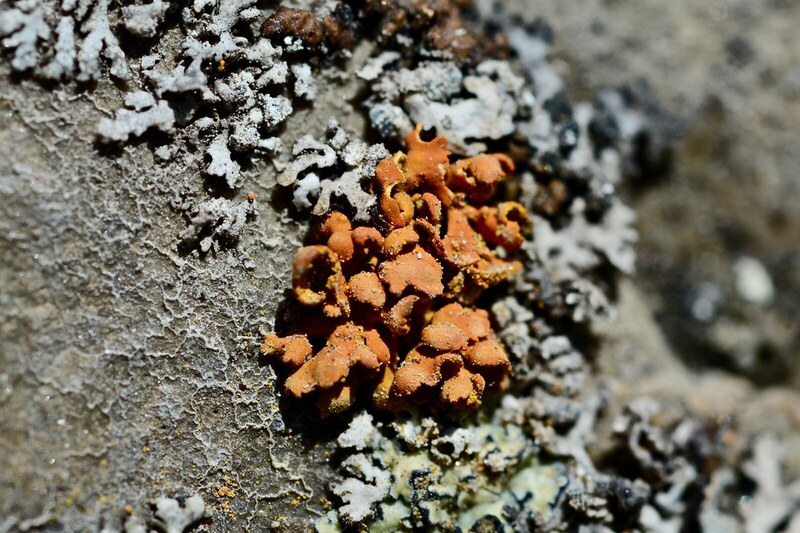 And finally a close-up of some of the lichens in the gold colored section (which I believe are Candelariella rosulans). 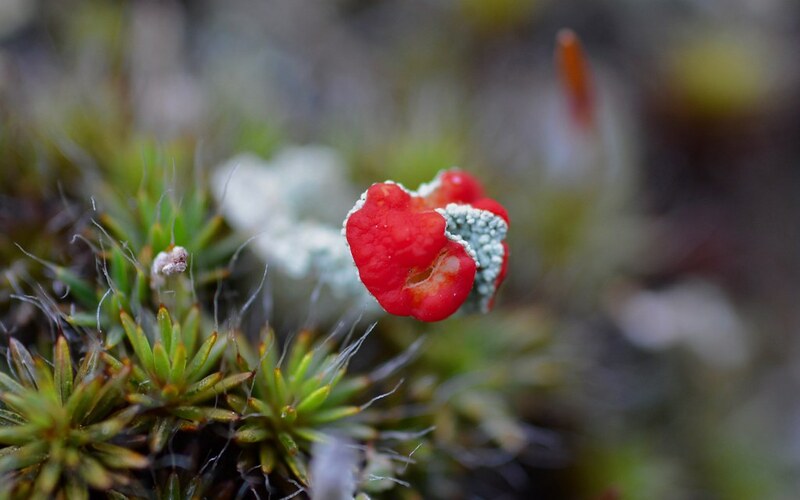 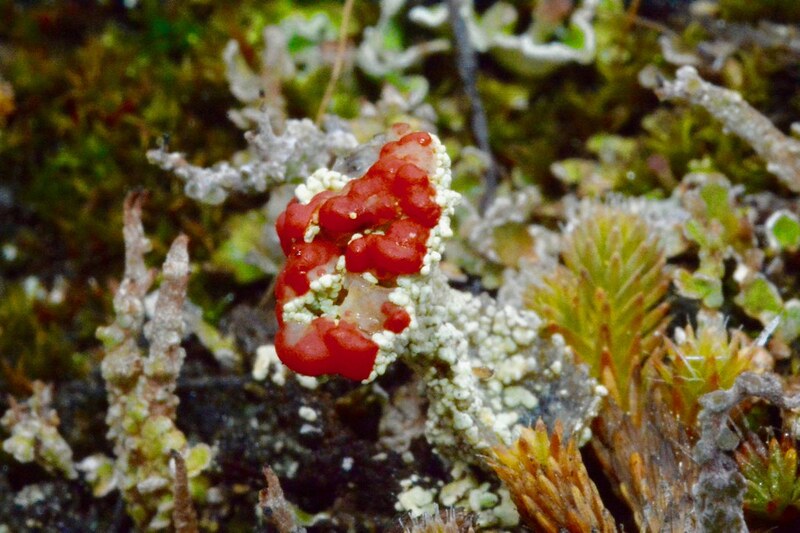 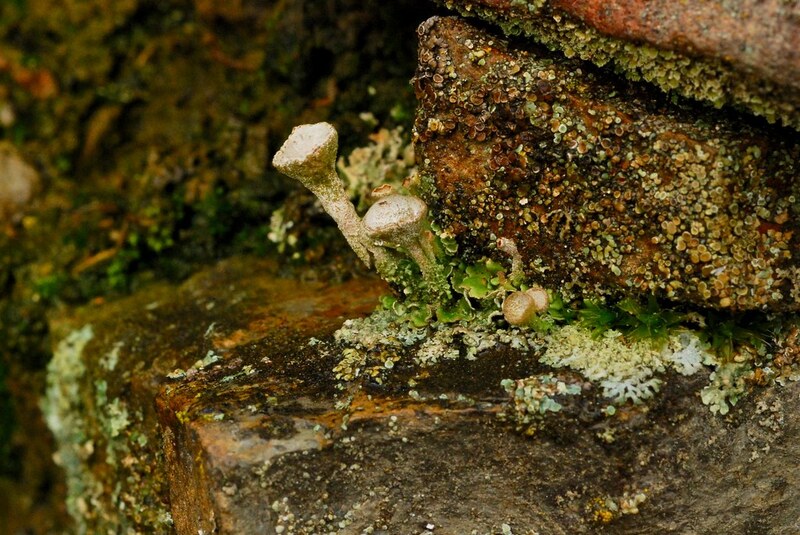 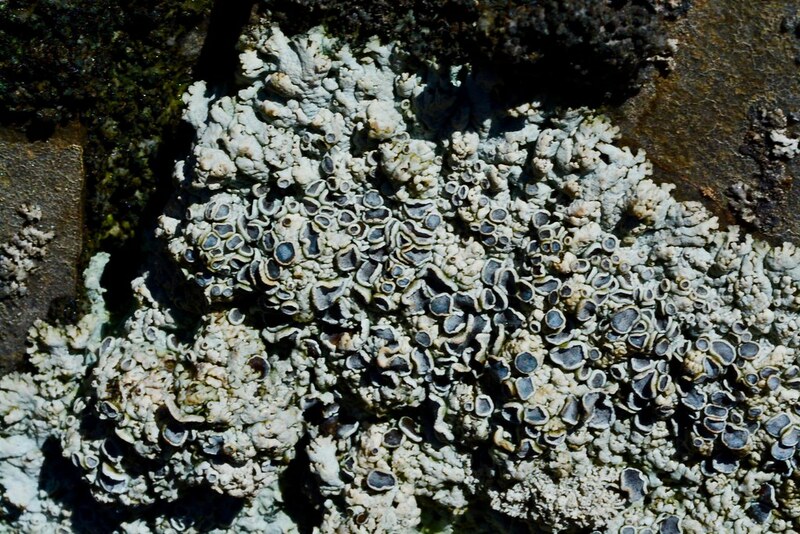 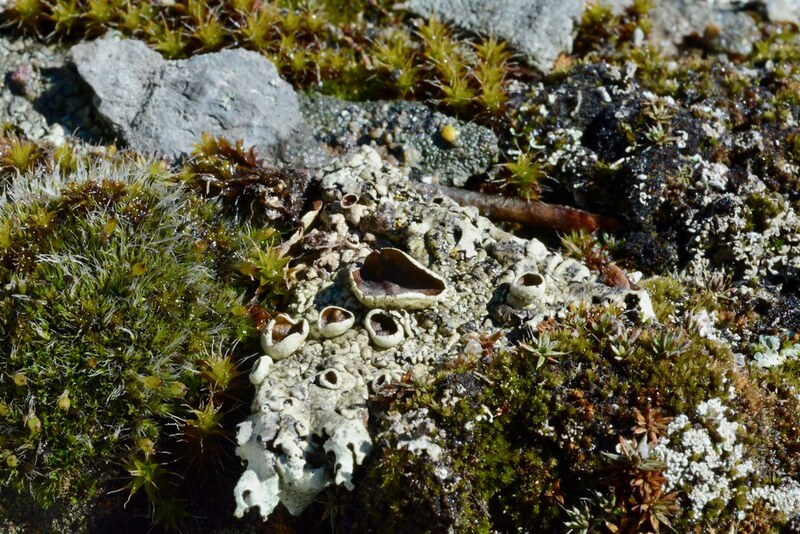 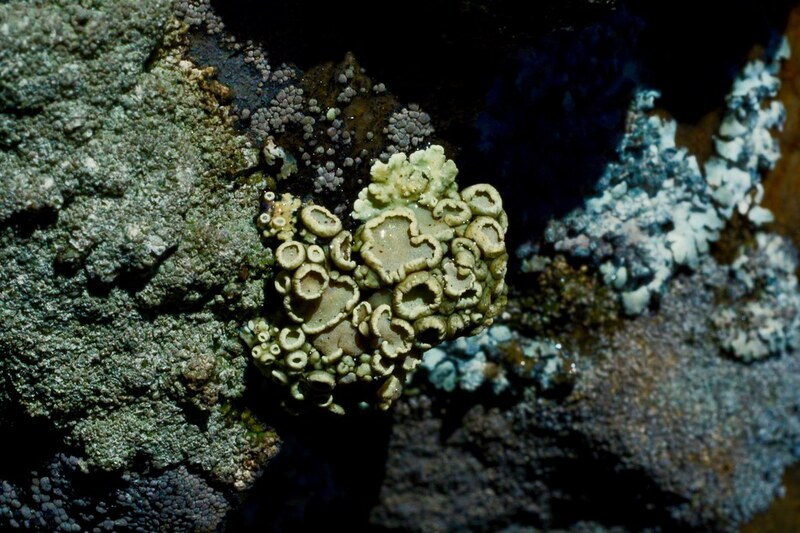 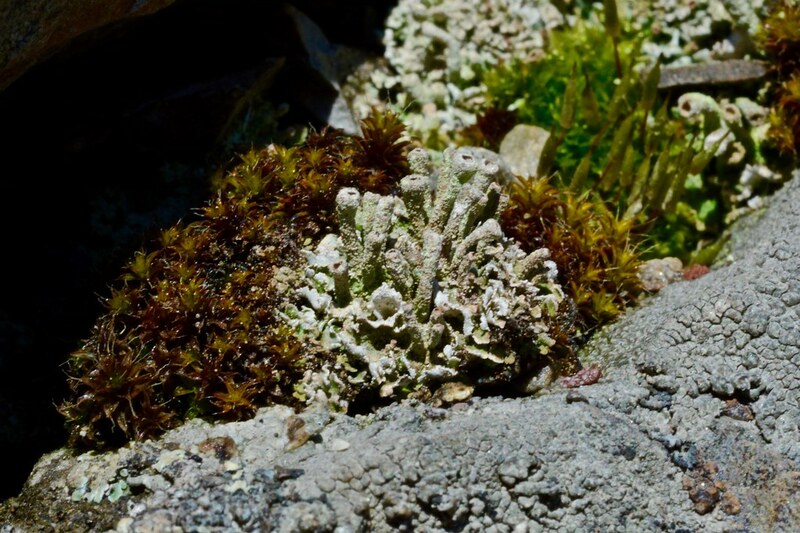 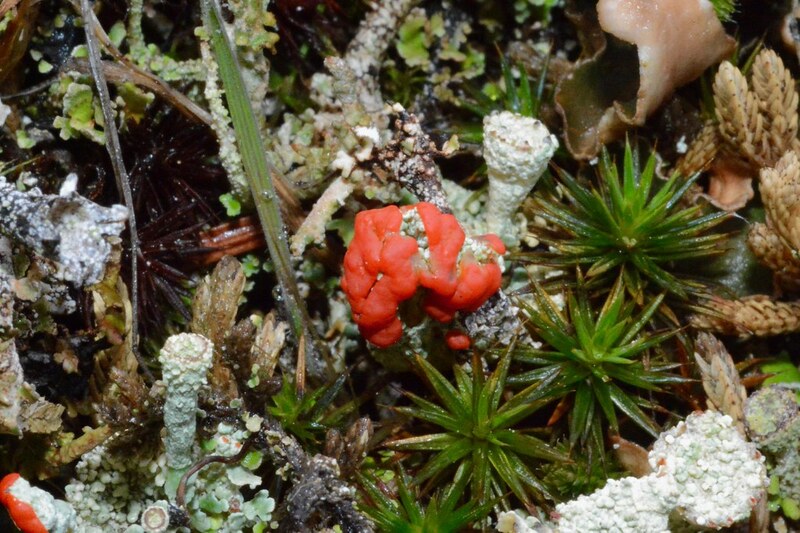 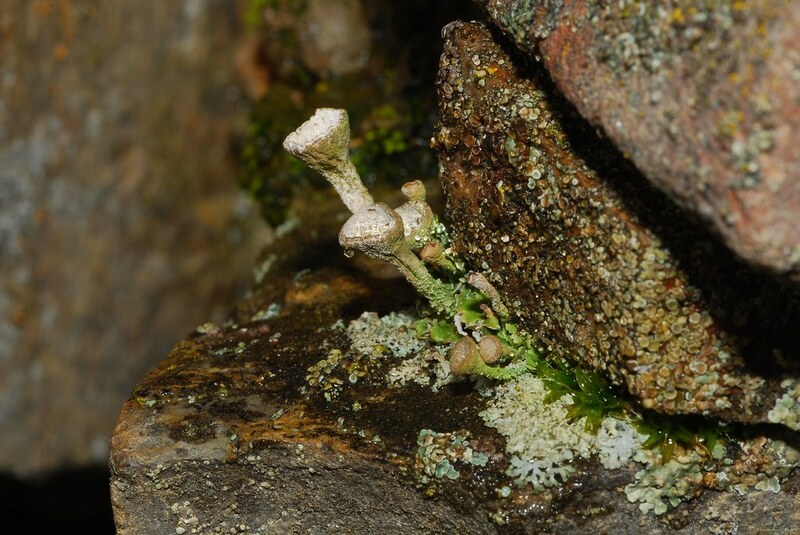 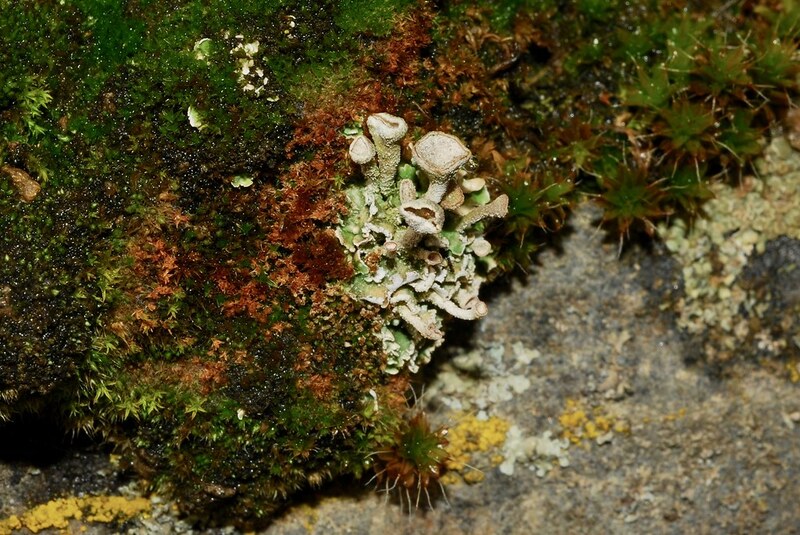 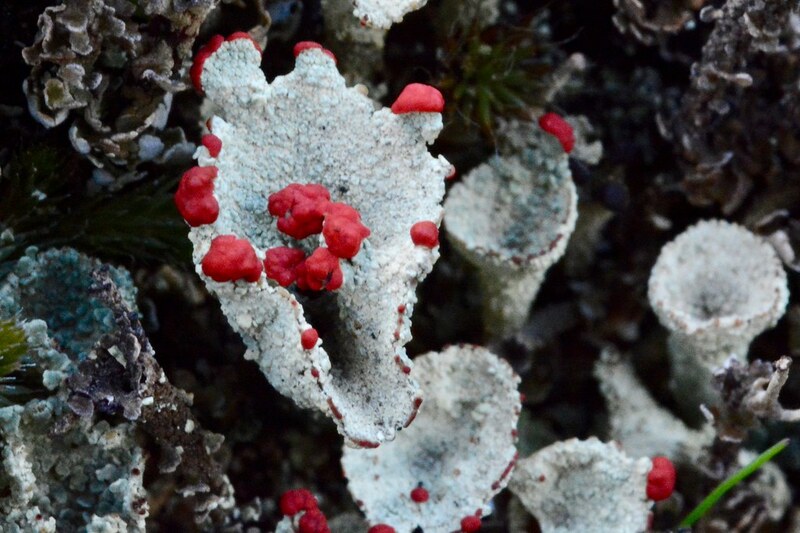 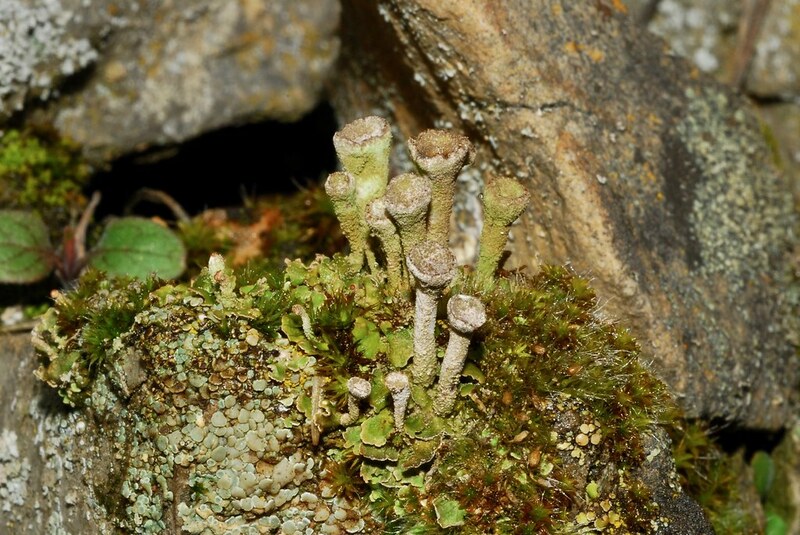 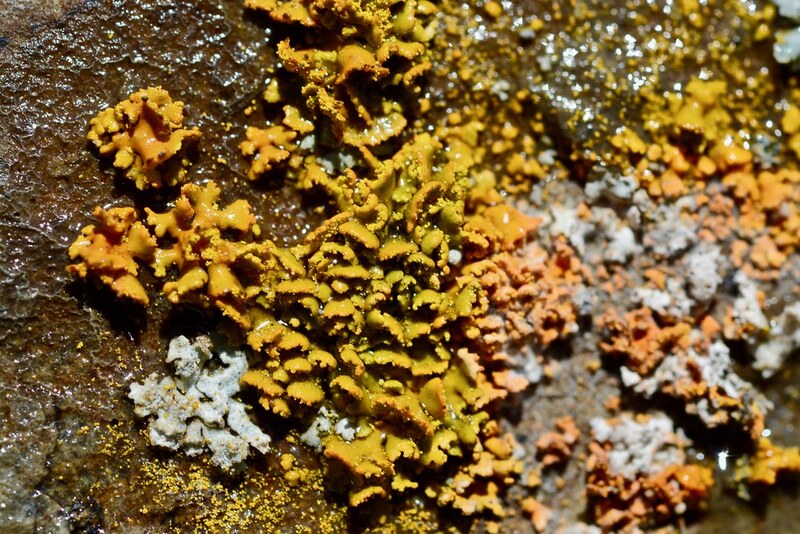 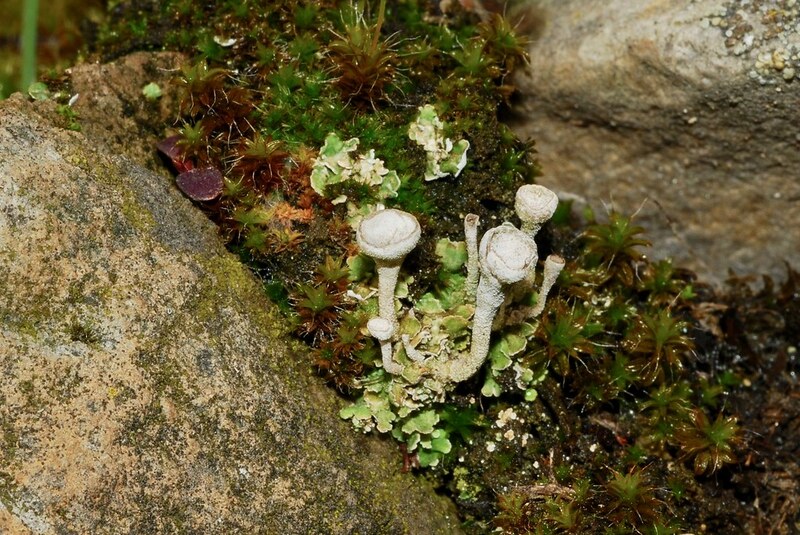 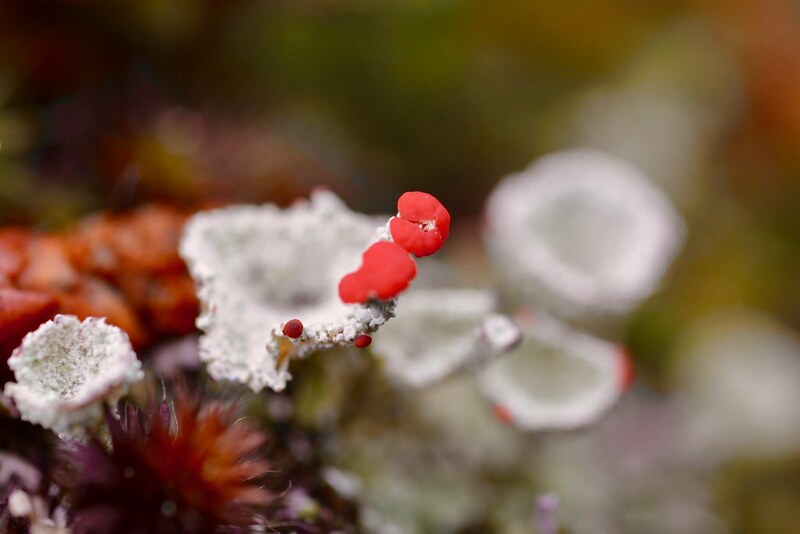 While lichens are not true “species” in the conventional meaning of the word because each lichen is a composite of a fungus and an alga, they are categorized similarly and I’ve read that there are up to 25,000 “species” or “mutualisms” of them worldwide. 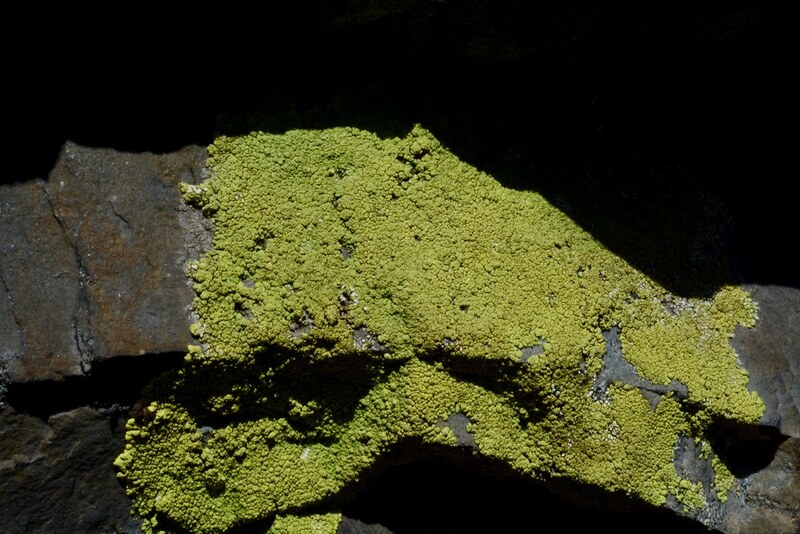 It’s understandable but a little sad that most of them are either overlooked or ignored. 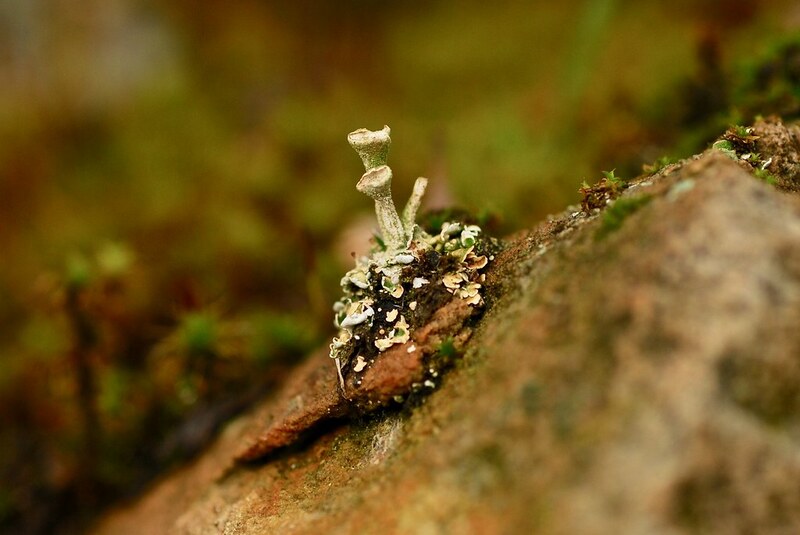 On a walk today I noticed some Pixie-cup lichens that were making their homes on a small stack of rocks. 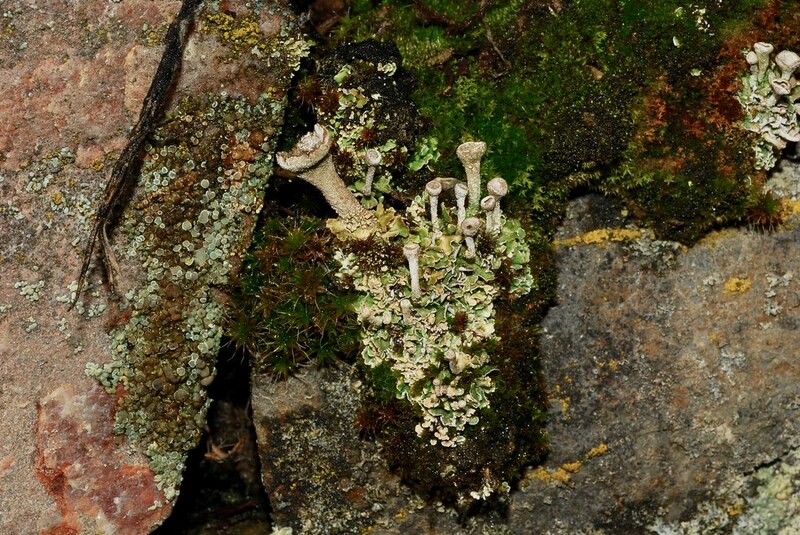 They were growing in small groups spread well apart and reminded me of families that might have gathered to have family portraits taken.